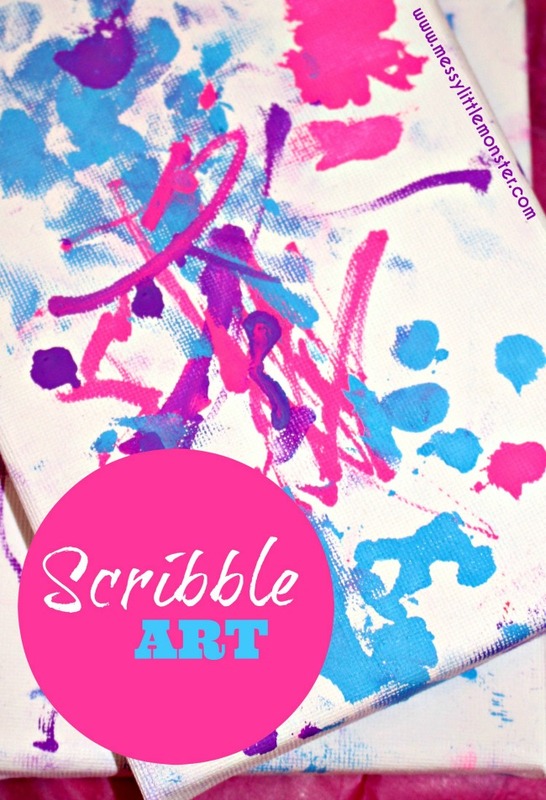 Toddler scribble art on a canvas makes a perfect gift. 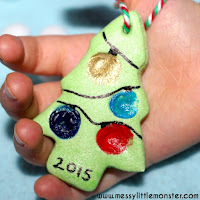 The youngest of children will be able to make gifts for family using this simple and effective art technique. The artwork will look great hanging on the wall and double up as a keepsake to treasure. Choose a favourite colour or two or alternatively choose colours to match the room decor. 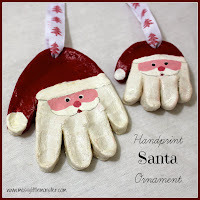 Are you looking for gifts kids can make? 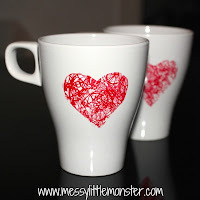 Take a look at our heart scribble mugs, salt dough handprint bowl and child's drawing keychains. 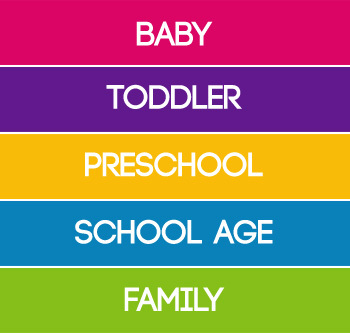 Firstly choose the colours that you would like your toddler to work with. I like to limit the number of colours. For this piece of artwork I chose colours that I knew the person recovering this gift would love. 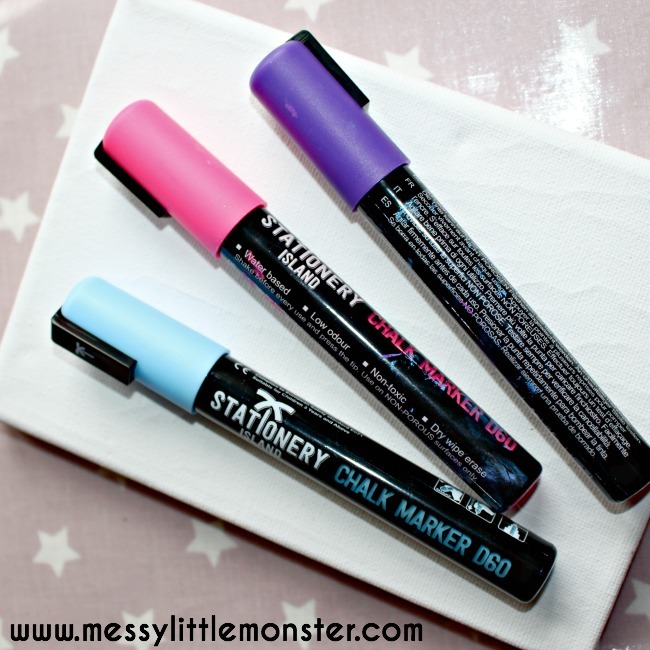 Older children may like to choose their own colours or use the whole pack of pens! 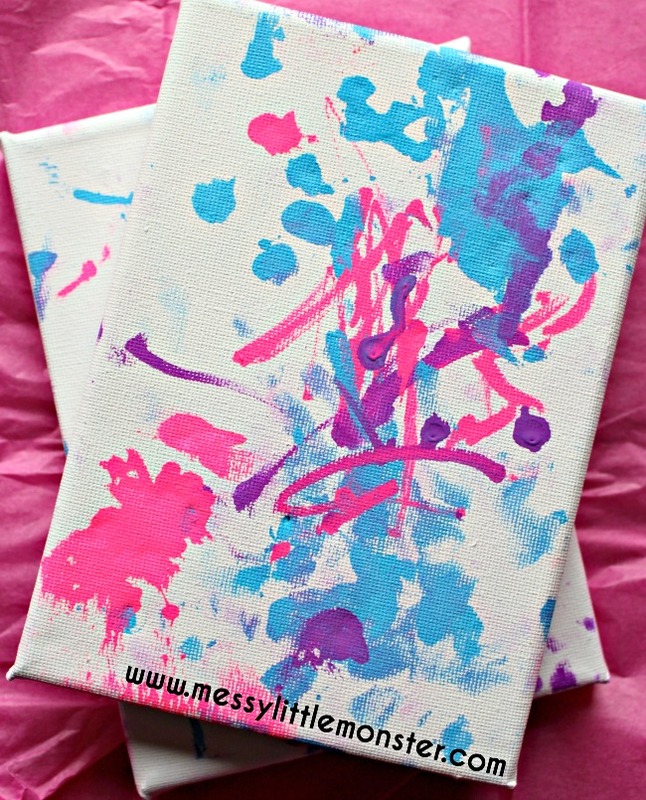 Give your toddler the chalk pens one at a time and let them experiment with making marks on the canvas. Daisy (20 months) loved pressing the pens down on the canvas so that the ink started to spill out a little, she enjoyed smudging it around with her fingers. The pens dry quite quickly so your toddler will be able to make marks in a new colour on top of the marks they have already made on the canvas. I think the completed artwork is really effective, and it is entirely your toddlers own work. Definitely a keepsake to treasure! We made a pair of canvases in the same colours to be hung side by side. 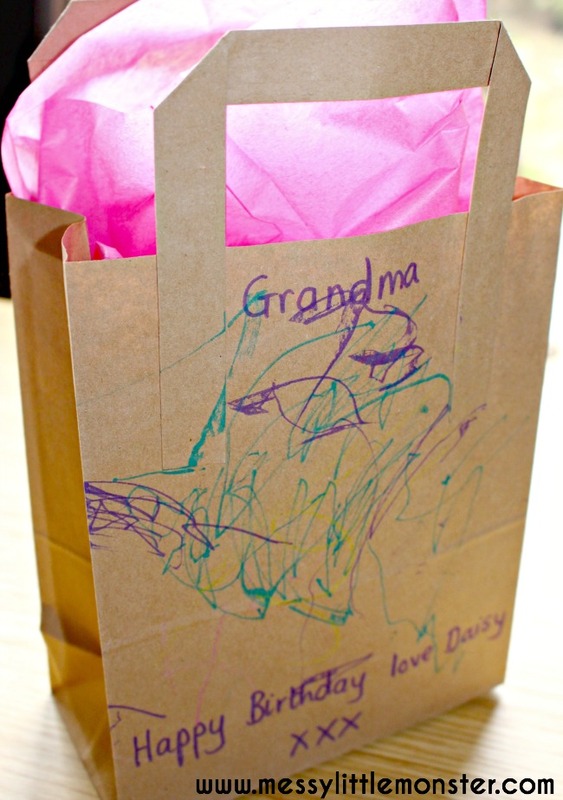 After making the scribble art canvases we made a personalised gift bag to put them in. I wrote a message onto a brown paper bag and Daisy added her artwork. We wrapped the canvases up in matching pink tissue paper. 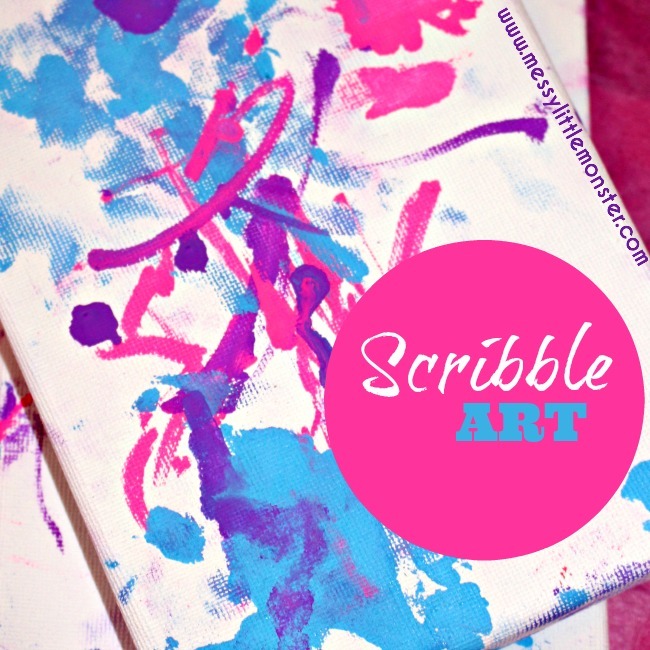 We made these gorgeous scribble art canvases for Grandma's birthday and she loved them. 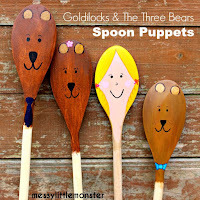 They would be perfect as Christmas gifts for family from a young child. 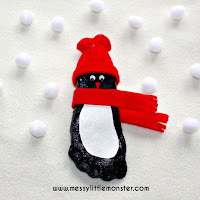 If you are looking for more Christmas gift ideas take a look at these cute snowflake bookmark from Preschool Toolkit or take a look at Teach Me Mommy's list of 15 kid made gift ideas. 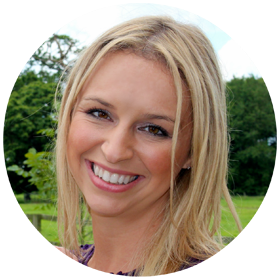 We love making personalised gifts. 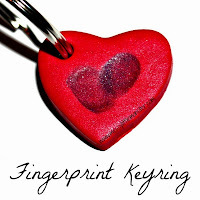 Take a look at all our DIY gift ideas and keepsakes to find something unique to make. These look so pretty! I'd love a set to hang on my walls. I think I will do as you suggested and pick just a few colors, though, or my oldest would go nuts using every single color.